Drive in impressive luxury in this 2019 Range Rover Supercharged HSE available at Land Rover Colorado Springs. This performance SUV is loaded with top features that will create a comfortable and exciting drive, from daily commute to family road trip. Imagine the comfort you will experience with the 20-way heated/ cooled front seats! Rear seat passengers haven’t been forgotten either, with their power reclining heated rear seats. Everyone can find the perfect temperature with the 4-zone climate control system. Enjoy the amazing sound quality of your favorite music with the 825W Meridian Surround Sound System. This system has 19 speakers including a subwoofer. The innovative Drive Pro Pack offers an exciting variety of driver-assistance features. Those include Driver Condition Monitor, High Speed Emergency Braking, Traffic Sign Recognition, Adaptive Speed Limited, Blind Spot Assist, Adaptive Cruise Control with Stop & Go, and Lane Keep Assist. The express open / close sliding and tilting glass first and second row sunroof with power sunshade is an excellent way to appreciate a beautiful day even while driving. Other features for you to appreciate on this Range Rover include heated steering wheel, heated windshield, rain-sensing wipers, and headlight cleaning. You won’t miss out on exciting performance with this luxury SUV. It as a 3.0L V6 Supercharged engine paired with a ZF 8-speed automatic transmission with intelligent Start / Stop. You can expect an estimated 23 mpg highway and 17 mpg city fuel economy. This vehicle also has adaptive, auto-leveling suspension and Trailer Sway Control. 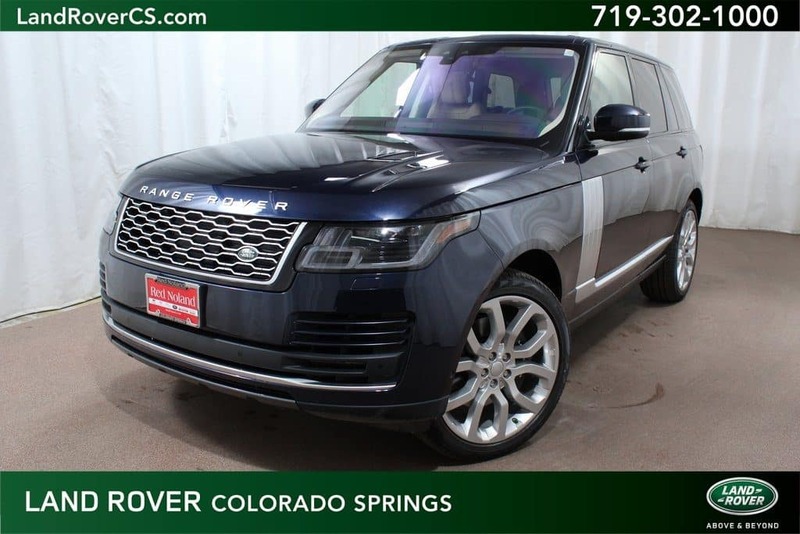 Visit Land Rover Colorado Springs and let us show you the many super features on this 2019 Range Rover Supercharged HSE. Take a test drive and be impressed by the power and performance that come standard with this luxury SUV.